Formed in Wolverhampton way back in 2013 Gin Annie is a band built around cousins Dave Foster (vocals) and Byron Garbett (guitars). November 2017 saw a line-up change with a whole new rhythm section recruited and with them came new drive and impetus. Tour shenanigans saw the band bruised but unbowed and from that adversity comes their debut album, the aptly titled 100% Proof. It’s a record that’s heavy enough to please their growing legions of fans and, with a melodic sensibility, could quite possibly cross over into the mainstream. ‘Love Ain’t Here’ opens proceedings in fine style with a swirling riff and some powerhouse drumming. The group display a strong set of song writing skills which sets the tone for the rest of the record. 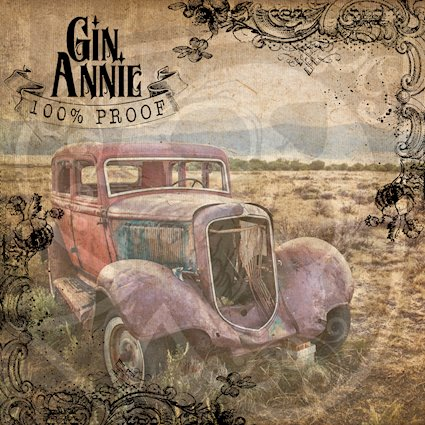 Gin Annie have taken their appreciation of bands like Blackberry Smoke and Black Stone Cherry and married it to a love of ’80s classic rock but they’re no mere copyists. Gin Annie are a band who are so far removed from their influences that it’s hard to draw comparisons and the resulting sound is refreshingly original. With an inherent groove and a huge anthemic chorus ‘Dead & Gone’ seems tailor made for the biggest stages and it’s the type of tune that will haunt you long after the disc stops spinning. Dave Foster has a huge vocal range and he puts it to good use by entwining his voice around the guitar lines and while the solos are free flowing they’re restrained. It’s the kind of song that’ll go down well on a Saturday night with some fine malt whiskey. Accompanied by a great video ‘Chains’ has a hypnotic, dreamlike quality. Some southern styled slide guitar (think Skynyrd) is juxtaposed with a riff that really hits. ‘New Bad Habit’ really rocks with drums and guitar combining to create a real punchy sound that hits hard and it’s sure to rock any venue. A tale of nocturnal exploits(!) ‘Next 2 Me’ opens with an insanely addictive guitar riff and its the kind of riff that rock n’ roll dreams are made of. Capturing the excitement of the weekend it’s full of catchy lyrics and neat time changes. It’s a real earworm that’ll burrow deep into your cranium. Two adrenaline charged rockers ‘Damage is Done’ and ‘Fallin” follow to keep up the frantic pace. Defiant, like all good rock should be ‘All I Want’ is powered by some hard hitting drums and some fine soloing very much in the vein of Angus Young. Great music for a road trip it demands you constantly hit repeat. ‘Haunt Me’ is the obligatory power ballad, lyrically deeper, it seems a little out of place on an album of all out rockers but it does show another facet of the band, creates a change of pace and subsequently makes the raucous tracks seem more heavy. Normal service is resumed for album closer ‘Born to Rock n’ Roll’ which succinctly encapsulates what we all love about rock music in three and a half minutes. “I don’t care what people say, I’m gonna party all night and sleep all day” sings Dave Foster against the backdrop of a mammoth riff. It’s the shortest cut on the album and here’s the rub; all the other songs break the four minute mark and while none of the tracks seem forced or deliberately elongated they’re an embarrassment of riches and simply overflowing with ideas and subsequently some great work gets lost in the mix. I feel a little judicial pruning, shaving a little time off some songs and saving the odd riff for the next record would have made the songs more direct and immediate. But that’s just a minor complaint. As debut albums go 100% Proof arrives almost perfectly formed and is sure to propel the band towards bigger things.